When looking out from any point in DO Montsant the immediate element that strikes the eye is the light. The lands that comprise this Denomination of Origin in Catalonia are bright and open, old and welcoming, farmed and lived in. These are but a few of the words to describe this side of the Priorat coin. It is the oft-repeated phrase that DO Montsant is just like DOQ Priorat which it wraps around, except cheaper. While they share the same Catalan county or comarca called Priorat, nothing could be further from the truth. DO Montsant is DO Montsant with its own unique character and style. People say they find it easier to define DOQ Priorat because the soil is 90% llicorella slate while DO Montsant has so many different soils that it would seem there isn’t a common thread, but there is: history. There are more old vines in DO Montsant than in any other other part of Priorat. While obviously none of them pre-date the arrival and devastation of phylloxera, stumbling across wines made from the grapes of 70 or 100 year-old vines is commonplace. Then there are the families. By and large, the people making wines in DO Montsant are the same ones that have been making them for the last few centuries, or maybe even before. The villages that dot DO Montsant are lively and singular to the point where they even have their own accents. This is in sharp contrast to DOQ Priorat where the Barcelona accent is much more commonly heard due to the influx of outsiders in recent years. But in addition to the mannerisms, each village has their own families that managed to stay and survive unlike the 20th century abandonment found in the more isolated villages by the rugged, steep slopes at the center of the Priorat comarca. Please peruse more articles about the wines of Montsant. 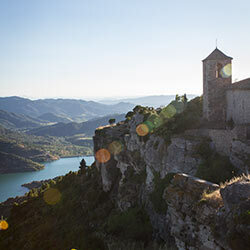 This is a small excerpt from the Vinologue Montsant guidebook that covers this wine region of the Priorat county.